Phyllis Jean Newsletter, Issue #013 -- New Blouses! We have a new aspect to our site...read below! We have been working hard to continue to improve our website and your shopping experience. We have designed a third column on our site that will list our items currently on sale! Our Website Specialist is also currently revamping all the links to our store so that you (the shopper) get more specific results. The sale code is 1234. All the items are on the right side of our website. Take a look and enjoy shopping! We have some new blouses on the way! Have you started to browse through seed catalogs and plan warmer weather trips? What about a new spring wardrobe to get excited about? 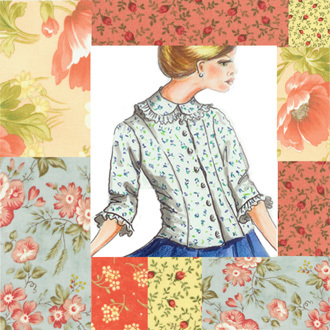 We are going to be offering 5 new blouse prints this spring. For our customers out of the U.S. please email or call your orders in. We will use a different shipping method to save you big bucks. We have generic shipping calculator for orders outside the US, and it will most likely over charge. So please call! What’s the most popular seller you might ask....Our bamboo leggings are number 1. They are excellent at keeping you warm and toasty this winter season. They come in fun cheerful colors to brighten up a stormy day. We also offer bamboo underblouses and little girls turtlenecks. To check out the leggings...click here! To check out the under blouses click here! To see the turtlenecks click here!